After that day all I wanted to do was be able to replicate that delicate recipe. And after years I was able to do it. I know you must be thinking rice pudding is really not a big deal. Many recipes, many variations, many flavor profiles…but I’m telling you once you try this one it will be a smile on every bite. My sister in law Monica loves it with lemon peel since she was born and raised part of her life in Spain and for them it is a traditional with the lemon peel but in this recipe specifically I use orange peel. If you like a little more acidic flavor or to balance the sweetness a little more you can substitute my orange peel for lemon peel. Either way it will be delightful. Sometimes I spend a lot of time trying to think outside the box, creating new recipes or putting a twist on traditional ones but today my husband asked me to make one of his favorites and that’s why I’m sharing this rice pudding recipe with you.It is back to basics! I love snow days like today…I get to relax, spend time with my family and I get dirty in the kitchen! I really hope you like this recipe as much as we do. Add the evaporated milk and bring to quick boil, add the 2 cans of condensed milk and start cooking at medium heat moving constantly with a wooden spoon to avoid sticking to the bottom of pot. Add the raisins and vanilla extract. Keep stirring. When the milks and everything starts getting together (about 5 minutes) add the beaten egg yolk. When you add it it has to be very slowly and the pit should be outside the heat to avoid the yolk to cook like scramble egg. The way I do it: I take a little of the milks from rice pudding cooking out to the bowl where I have the beaten egg yolk to temper the yolk. I whisk very fast until we’ll combined. Then I add that mixture to the entire rice pudding. The benefit doing this is that it’s easier to mix it and less risky. If your yolk cooked then it’s easier to replace it for a new one rather than make a whole new rice pudding, don’t you think? The yolk is necessary because it is the element that makes the milks thicker and give consistency. After this process you just have to mix for another 5 minutes and it is done. 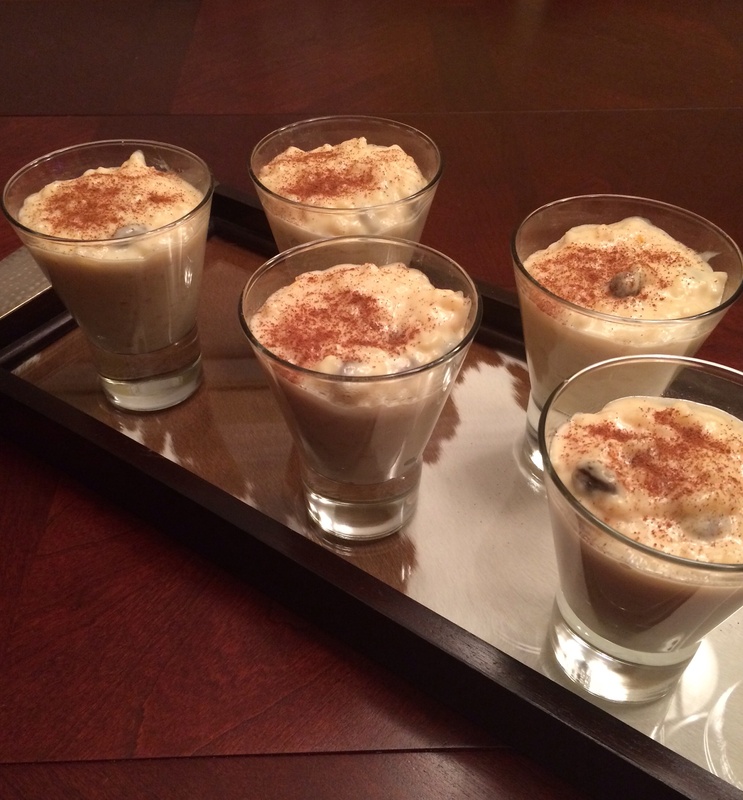 Be devoted to your rice pudding…the string process is a main factor.